Harper decides to spend the summer doing some good for the world by joining a group of teens who are helping a family in Tennessee rebuild their house after it has been destroyed by a tornado. But this trip is more about running away from her disintegrating family at home than learning to build a house. However, as far away from her family as she has gone, she can't quite escape reminders of what is back there. And the friendships she will develop in the summer will simply complicate those issues. I liked Reinhardt's previous Harmless a lot and Brief Chapter in My Impossible Life was a near perfect pick for me, but this latest effort never quite engages me. Perhaps it is the story itself rather than the writer. 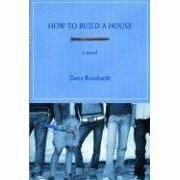 Reinhardt, in my opinion, is fast rising to challenge Sarah Dessen's mantle as the Queen of YA, and How To Build A House has the same beautiful writing of her previous works. It still has the great insights that make you sigh. But I found the flashbacks to her past at home to be quite jarring and the housebuilding analogy was overextended. This is a good book, but not her best one.